No EU funds will go for unreformed sectors in Bulgaria for the next programing period, warned Bulgarian caretaker Deputy-PM Iliyana Tsanova. “Preparations for the 2014-20 programing period are under way. So before voting, Bulgarian citizens better check carefully the programs of the various political parties,” said Tsanova for bTV Sunday. According to the minister, who is in charge of Bulgaria’s EU funds absorption, the country must implement reforms in particular in the health system and the judiciary, to be able to receive funds in those areas. She stressed that the preparation for the next EU programming period is among the key priorities of her ministry. According to Tsanova, by end of 2013, Bulgaria will absorb EU funds worth EUR 2 B, which is equal to the amount for the last 2-3 years. Bulgarians are to vote on early elections May 12, following the Feburary resignation of PM Boyko Borisov, just months before the end of his term in office in July. Bookselling giant Amazon announced late last week that it is acquiring Goodreads. The purchase price was not revealed. The transaction is expected to close later this year. Book lovers know Goodreads as the large and increasingly popular book-review site with a strong social element. At Goodreads you can review books, discuss books, and connect with other readers based on mutual interests. Goodreads says on its website that it is “the world’s largest site for readers and book recommendations.” Based in San Francisco, Goodreads has 16 million members and 23 million book reviews. One of the plans is to make Goodreads integrate with Kindle. Goodreads CEO Otis Chandler will report to Amazon’s Vice President of Kindle content, Russ Grandinetti — a telling clue to where Goodreads fits in the overall Amazon strategy. Goodreads will be run as a separate subsidiary of Amazon, much like Zappos. A concern among Goodreads users is whether the review site can maintain neutrality toward other retailers, once it is part of the Amazon family. While some will surely make similar gestures, the announcement is unlikely to cause a mass defection immediately. People don’t like to switch apps, and as I point out below, there aren’t many Goodreads alternatives that offer the same social community and ecommerce-platform independence. The real impact will depend on what Amazon does with Goodreads over the medium and long term. Up to now Goodreads has been seen as independent of any particular retailer. In an interview on Paid Content, Goodreads CEO Otis Chandler reiterated his desire for that retailer-neutral element to remain. However, that decision will not be up to Chandler alone. Autonomy has a way of going out the window after a while, in most acquisitions. Amazon has shown intolerance when it comes to using its data in sites that give visibility to competing retailers. Goodreads itself discovered that last year, causing it to stop using the Amazon API. Chandler said that Goodreads would continue to offer its own API. The API gives third parties access to certain Goodreads data. Entrepreneur authors of business books have caught on to Goodreads as another place to develop an audience for their books. When I first joined the site two years ago, it had a decided focus on fiction books. But in the past year I’ve noticed business books being reviewed and discussed more frequently there — and more business authors joining. Goodreads encourages authors to connect with fans and develop a following, through its Author Program. Authors can have blogs, and host giveaways and Q&As on the site. There is a self-serve advertising program — and thousands of book clubs on the site to tap into and connect with. 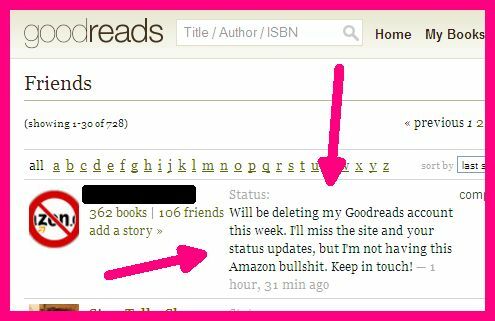 For those concerned about Goodreads becoming part of Amazon, there are some alternatives. Shelfari is not one of them. Amazon acquired Shelfari in 2008. Once promising, Shelfari seems to have been eclipsed by Goodreads. Of course, Shelfari never had as strong a social element as Goodreads. LibraryThing is another reader site with an Amazon connection. Abebooks, which is owned by Amazon, has a 40% stake in LibraryThing. LibraryThing’s website says it has 1.6 million book lovers as members. Google Books, through Google Play, offers a book app that combines the ability to purchase, store and review books. The Google Books app on my Nexus 10 tablet has a simple elegant interface. Goodreads reviews are incorporated into Google Books as one review source (along with some other sources). It’s not clear whether that will continue. But Google is ramping up its own social review capabilities. When you leave a review on Google Books it ties in with your Google+ account, so that your connections on Google’s social network can see what you think about a particular book, and vice versa, as the notice below indicates. Bookish, a joint venture of three publishers (Hachette, Penguin Books and Simon & Schuster) was launched just this year. It is an e-commerce site but also gives users their own book shelves. As you might imagine with a site owned by publishers, Bookish appears to be focused on presenting and selling books from a publisher’s perspective, and promoting their big-name authors. The community interaction element seems limited. Book Crossing, Book Rabbit and Revish are three smaller book-lover community/bookshelf sites. And then there are dozens of book apps – each seems to offer some different combination of features. Some are ebook readers tied to specific retailers (like iBooks, Nook and Kindle) that also allow you to keep track of your electronic books that you’ve purchased, but typically offer little in the way of social interaction and discussion around books. Book Crawler and ReadMill are two iOS book apps independent of any retailer and popular with readers. Kobo, headquartered in Japan, also has its own bookstore, tablet readers, and free reader apps. If you know of others, please share in the comments below. The post Amazon Acquires Goodreads: Impact and Alternatives appeared first on Small Business Trends. 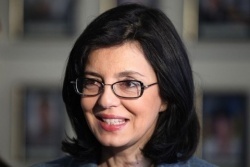 Former Bulgarian EU Commissioner Meglena Kuneva has said that news of hundreds of supporters leaving her Bulgaria for Citizens party won’t harm it ahead of May 12 early elections. “I am pleased that problems within Bulgaria for Citizens are emerging before the vote,” said Kuneva, suggesting that this will boost the transparency of her party. Sunday it was reported that many Bulgaria for Citizens supporters from Plovdiv have requested to leave on the grounds of an alleged mishandling of the party’s election lists. According to the dissenters, the arrangement of the lists has flouted promises for a balanced regional representation, favoring persons close to the party’s leadership. At the same time, Plovdiv party coordinator Dimitar Shishkov commented that the numbers of people leaving have been inflated, and that no significant splitting has occured. A several hundred people have gathered in what have become traditional Sunday protests across Bulgaria. The rallies this Sunday have confirmed the trend for a dwindling number and duration of the protests with each week, reports Darik Radio. Several dozen people gathered in Bulgaria’s two largest cities, Sofia and Plovdiv, with not much more than 100 coming out in Varna. Protesters called for the abolishing of monopolies, especially in the energy sector, protested high bills and called for a change in the political system and economic development of Bulgaria. Anti-stagnation protests erupted early February, and quickly led to the resignation of former Bulgarian PM Boyko Borisov, on February 20. Since then, protests have trickled off. Currently governed by the caretaker cabinet of PM Marin Raykov, Bulgaria is set to hold snap elections May 12. Top officers in the Bulgaria’s Ministry of Interior are politically dependent on former ruling GERB party, claimed leading Bulgarian Socialist Party functionary and former Bulgarian Interior Minister Mihail Mikov ahead of May 12 early elections. “The politicization of the Ministry of Interior top personnel was conducted in several stages during GERB’s rule since 2009,” said Mihov in an interview for the national radio. “This has resulted in an enormous influence that can for instance engage criminal inidviduals in a diven direction ahead of or during elections,” commented Mihov. The former MP and Interior Minister recommended that the caretaker Minister of Interior, Gen Petya Parvanova, conduct a rotation of police unit directors for the election day, so that the opportunities for undue influence are minimized. At present, the Ministry has commited only to rotating regular police officers for the vote. Non-aligned MEP Slavi Binev and controversial businessman and former secret agent Aleksei Petrov have joined forces for upcoming May 12 early parliamentary elections in Bulgaria. The coalition was announced at a press conference Sunday, and will have to file documents with Bulgaria’s Central Electoral Commission through Monday. It includes the GORD party, recently founded by Slavi Binev, as well as the Free People party, known to have been founded by persons close to Aleksei Petrov. A number of other minor organizations, such as the United Bloc of Labor, the Defense Union of Patriotic Forces and the Christian-Social Union, have also joined. The coalition will run in the May 12 vote under the monicker “Gorda Bulgaria” (meaning “proud Bulgaria,” taking up Binev party’s acronym GORD). In 2009, Slavi Binev was elected to the European Parliament in the lists of major nationalist party Ataka, but has since parted ways with them. Kiril Gumnerov and Stoyan Ivanov, former Ataka MPs who left the parliamentary group in Bulgaria’s last parliament, have also joined the Gorda Bulgaria coalition. 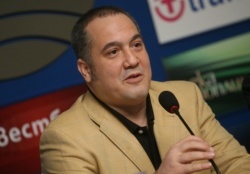 Aleksei Petrov’s name has been a mainstay in Bulgaria’s public life even before his much-publicized February 2010 arrest. Petrov has been tried in the so-called Octopus case, with former Bulgarian PM Boyko Borisov and Interior Minister Tsvetan Tsvetanov, publicly blaming him for standing behind significant parts of Bulgaria’s organized crime. In the 1990s, Petrov and Borisov had been partners, while working in the insurance and security business. On his part, Binev has also worked as a businessman in that area. Since founding GORD, he has mercilessly criticized Borisov’s term in office as inept. Borisov, Binev, and Petrov have also all had a common past as accomplished athletes in the martial arts. Saturday another election coalition was announced, between liberal National Movement for Stability and Prosperity, and the Dignity party, formed around Movement for Rights and Freedoms ex deputy chair Kasim Dal. The regime in North Korea adopted an official decision to develop further its nuclear potential, a day after it stated it is ready for war with South Korea. According to the position declared by Pyongyang, the country will never discuss a limiting of its nuclear program in return for international aid. The decision was adopted Sunday at a sitting of the central committee of the Korean Worker’s Party under the chairmanship of leader Kim Jong-un. North Korea has further decided to adopt legislative acts in support of the decision. “Our nuclear capacitiesi must be expanded and fortified both quantitatively and qualitatively until global de-nuclearization has been reached,” stated the North Korean government. The declaration also states the country’s resolve to pursue nuclear technologies for peaceful application. Did I ever tell you about the time my husband and I nearly broke up over a map? We had just started dating and decided to drive down to D.C. from Philadelphia, where we lived at the time. You know the kind of spontaneous road-trip I’m talking about? It’s the one where you have this great idea and decide on the spur of the moment to throw a few things into a bag, jump in the car and head out for a romantic weekend. Well, let me tell you that was a moment. I wasn’t sure if our relationship would survive it at the time. But since then, I’ve learned how to read a map and both our travel and our relationship have been on relatively smooth sailing since. Until that moment, I hadn’t realized how powerful a map could be. But when you really need to get to a destination and you aren’t quite sure where you’re going, a map is your best bet. Too many people get lost and wander aimlessly because they have no “roadmap” for where they wanted to go or if they did, they failed to use it. While so many books today seek to intellectualize or romanticize the business-building and business-running experience, Mariotti does nothing more than speak from his experience of running several world-class organizations. He served as the CEO of Huffy (when Huffy was the darling of marketing case studies) and Rubbermaid Office Products. What I’m trying to say is that this book is a pragmatic business owner’s handbook. It’s not grounded in any kind of lofty research nor does it contain dozens of case studies from big brands that you can’t possibly relate your smaller business to. Instead, it’s filled with practical lessons gained from real-world, on-the-job experiences Mariotti has learned from and now shares with you. What Makes Mariotti An Expert Worth Listening To? I first met John Mariotti almost 13 years ago through a mutual friend who invited me to be a part of John’s Enterprise Group, a coalition of time-shared advisors™ which he founded 18 years ago after having been the President of two companies and then Chairman of World Kitchen. John has written eight business books, a mini-book and even a prescient novel about cyber terrorism. In addition to all of his books, he’s written hundreds (maybe even thousands) of articles which have been published on Forbes and here on Small Business Trends. What makes him worth listening to is his experience of managing big businesses, small businesses and everything in between. I’m going to go out on a limb and say that if he hasn’t seen it all, he’s seen at least the 80% that counts. And more than that, Mariotti isn’t afraid of acting, failing, learning and trying again to gain better results. What I respect most about Mariotti is his openness, honesty and pragmatic sensibility when it comes to running a business. Like I said, I happen to have known John for quite a few years and was comforted to see so many of his favorite phrases and stories in this book mashed and combined with classic quotes from folks like Peter Drucker. Planning and acting is better than waiting and acting. Complexity is created with the best of intentions. PP*2 Does not equal FF — (Preserving the Past) and (Perfecting the Present) does not equal (Finding the Future). Nothing is more important in business – and in life – than people. There are many more of these simple phrases and explanations of how to use them to successfully run your business and make good decisions inside this small book of 122 pages. I would say that this book isn’t just for business owners. In today’s age where everyone is expected to be entrepreneurial – chances are, you’ll want to have a copy of this book and read it often. Roadmap to Profitable Growth is a book that you’ll read once all the way through, dog ear some of the sections that are worth returning to and then go back again and again to simply make sure that you’re still on the right path to profitability. The post Review of “Roadmap to Profitable Growth” appeared first on Small Business Trends.